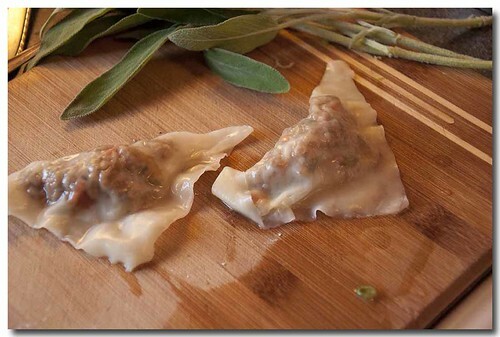 Meat filled ravioli finished off in a spicy sage butter sauce. This is a big hit using mostly leftovers. 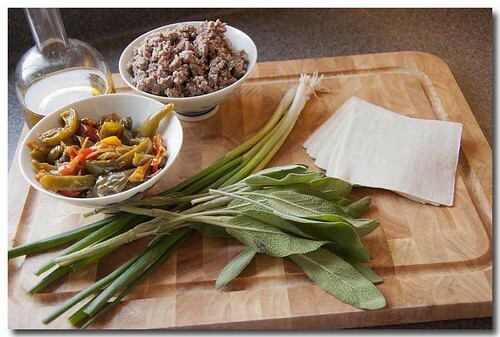 The ravioli ingredients are leftover cooked lean ground beef, leftover three pepper sauté , about a cup and a half of each, and spring onions. 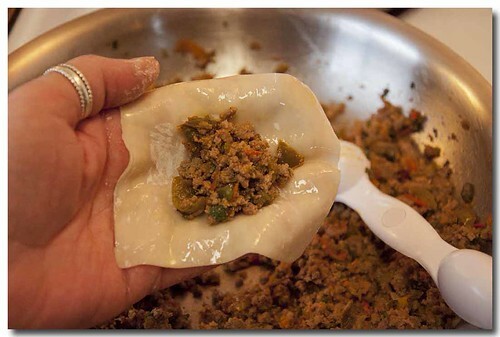 I was going to use some sage in the filling but changed my mind. I don't have a pasta rolling machine and I just can't seem to get my pasta thin enough so I used won ton wrappers instead. 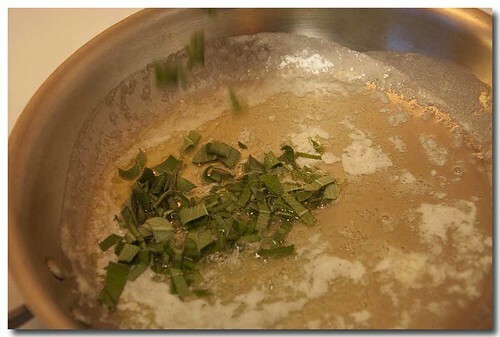 add to some olive oil in a medium skillet. 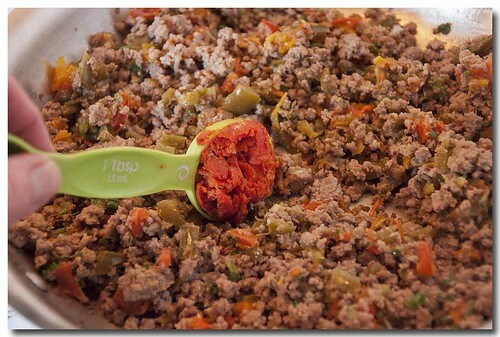 Crumble in the cooked ground beef. I didn't want any big chunks of meat so I broke up some of the bigger chunks as I added the meat. 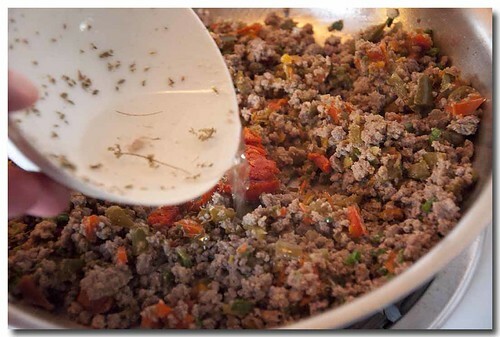 Roughly chop the peppers and add to the ground beef. and a tablespoon of tomato paste. It looks funky because I keep the leftover tomato paste in the freezer. 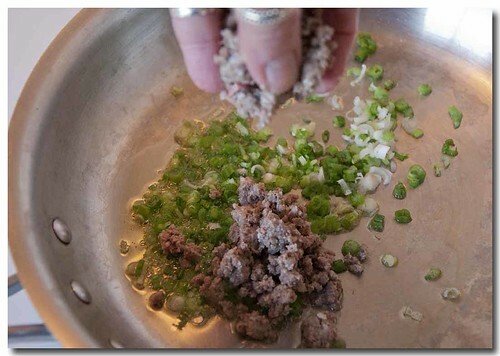 Add about 1/2 cup of water to the meat mixture. Thats' oregano residue in the bowl, waste not want not so they say. 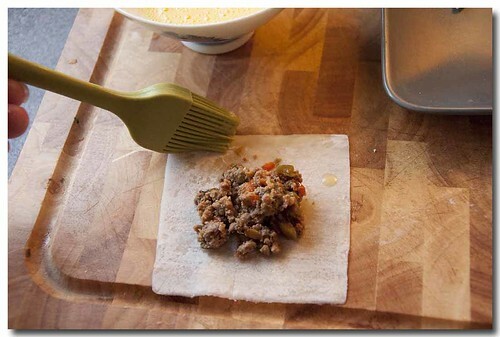 In a won ton wrapper put a heaping half tablespoon of the meat mixture. I brushed the edges with a well beaten egg. I was going to brush the edges with water, but since I was going to boil them I wanted a little more "sticking power." 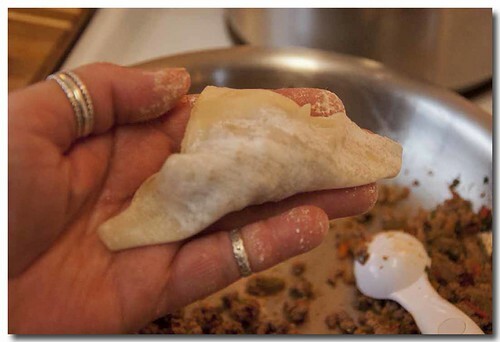 Fold in half going point, to point in any direction you want. Or, top with another won ton wrapper. 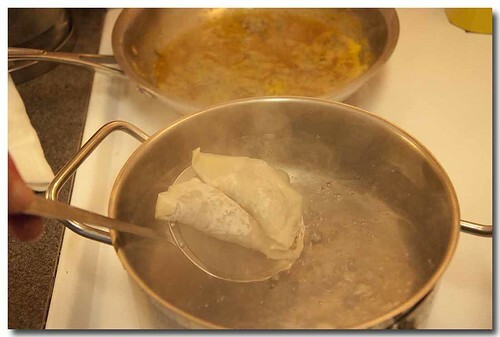 Before I proceeded with the rest of the ravioli I did a little test run to see how the won ton wrappers would hold up in boiling water. A few minutes is all that's needed, otherwise they tear easily. 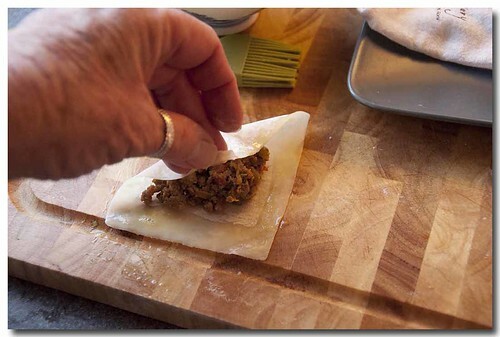 It didn't take long for me to discover that making the ravioli was easier done "in hand" rather than on the board. 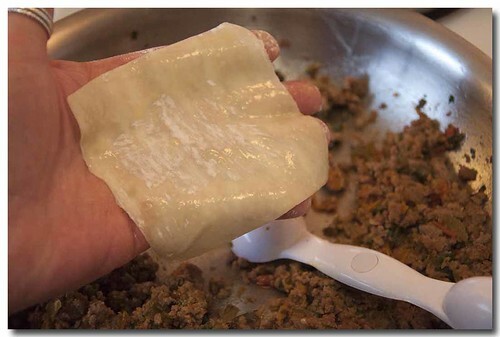 Give the wrapper a quick brushing with the egg wash.
Place the filling in the middle of the wrapper. Bring two points together. I joined the bottom point to the top point. The filling naturally fell into place and I only had to pinch the edges to seal. Easy, peasy and it went very fast. 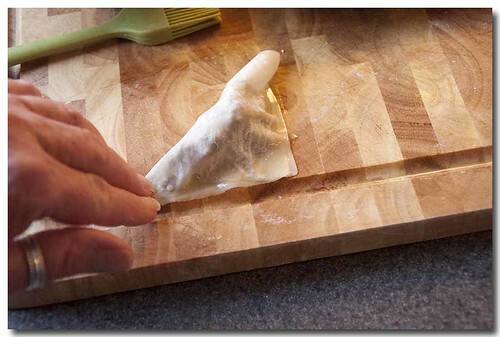 As you are making the ravioli keep them under a tea towel to prevent them from drying out. 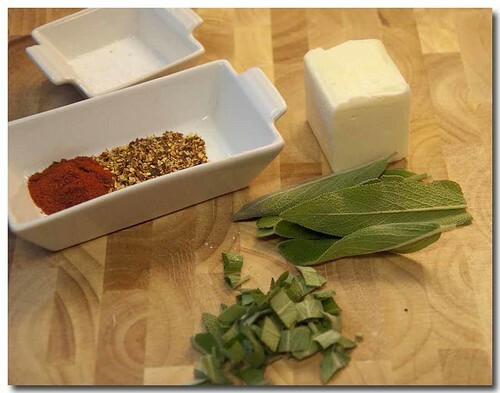 Ingredients for the sage butter sauce are butter, sage, paprika, crushed red chili flakes and salt. Give the sage a rough chop. paprika and the red chili flakes. Cook until the butter begins to brown. 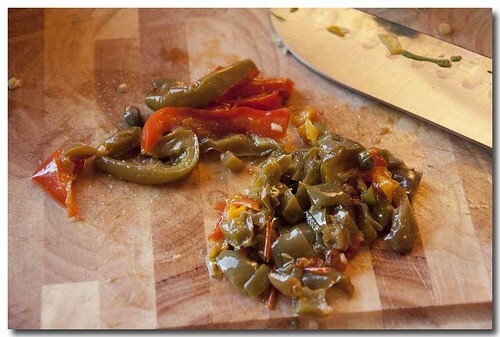 Remove from the heat and add the salt. 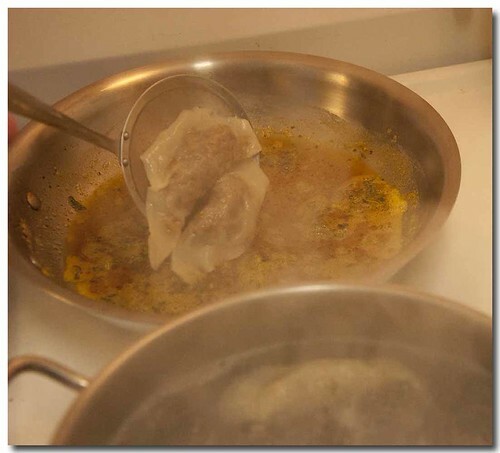 Cook the ravioli to boiling water for just a few minutes. 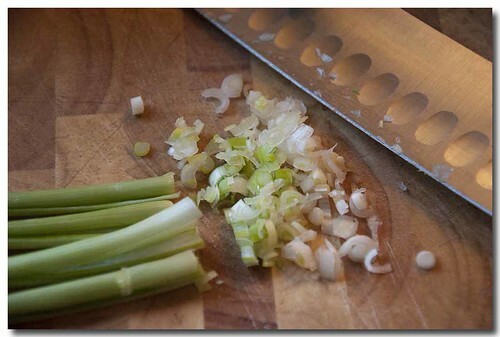 Give them a quick drain and add right into the butter sauce. 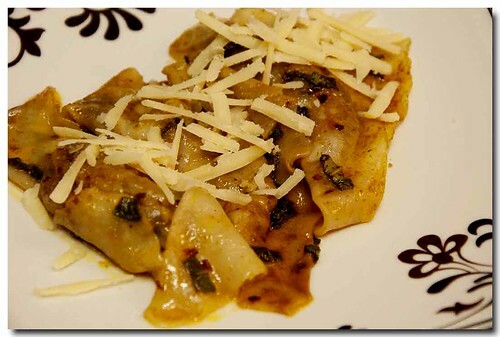 I used Giada De Laurentiis's sage butter recipe but the ravioli are mine, and I topped mine with Asiago cheese. 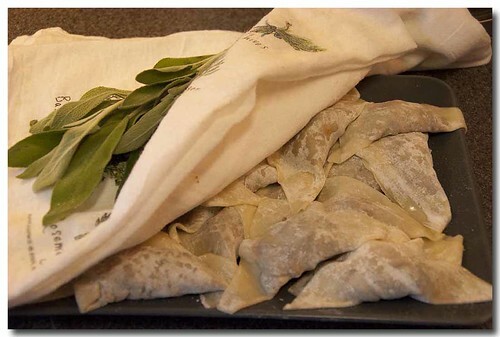 Here is her Ravioli With Spicy Sage Butter recipe. 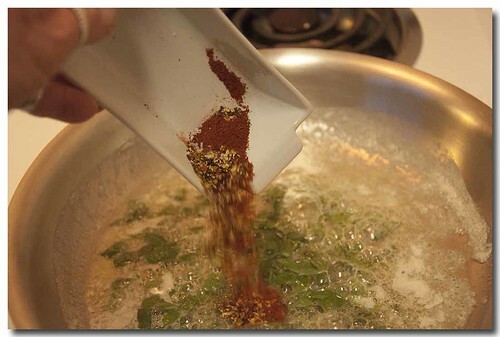 Bring a large pot of salted water to a boil over high heat. Add the ravioli and boil gently, stirring occasionally, for 5 minutes. 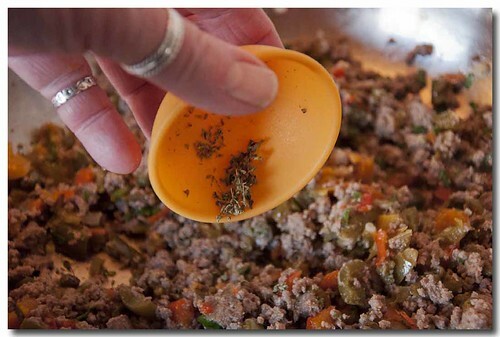 Drain and place in a serving bowl. 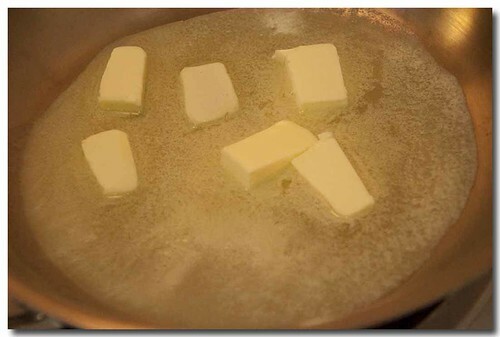 In a medium saucepan, melt the butter over medium heat. Add the sage,paprika, and pepper flakes. Cook until the butter sizzles and begins tobrown, about 2 minutes. 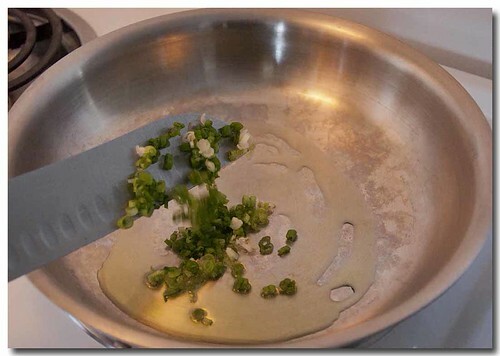 Remove the pan from the heat and stir in the salt. 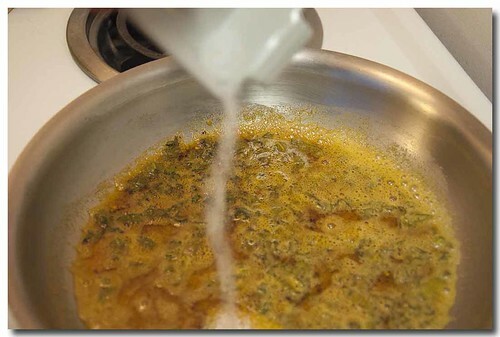 Pour the butter sauce over the pasta and gently toss until coated.